Mindy Kaling and B.J. Novak are best friends. This is fact. Last night, however, the Yanny vs. Laurel debate (aka 2018’s version of the blue dress vs. gold dress game) threatened to tear them apart, and honestly, same. 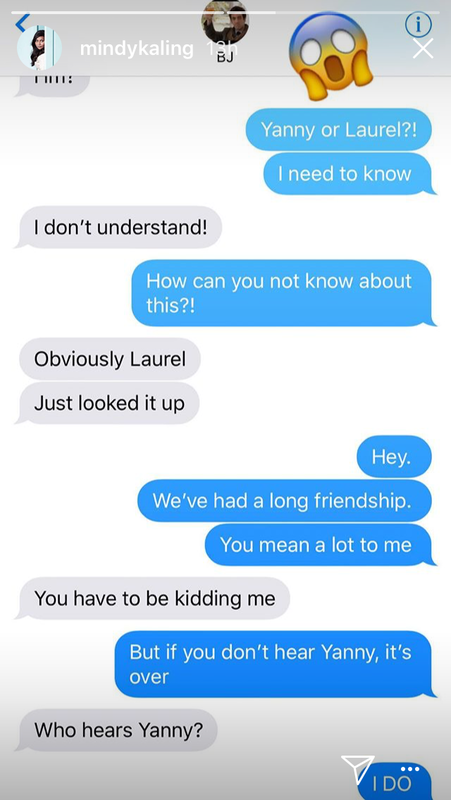 Friends, lovers, and families were driven to madness last night by the Yanny vs. Laurel debacle. How could you hear Yanny?! How could you hear Laurel?! By the way, the soundbite is *technically* Laurel. The New York Times discovered that it was pulled from the Vocabulary.com page for “Laurel” as the pronunciation guide. So, sorry, everyone, but it’s Laurel. Below, Kaling and Novak’s “feud” over Yanny and Laurel. Until the next viral craze to divide the nation, Kaling is firmly on Team Yanny. We hope this didn’t seriously cause a rift in Kaling and Novak’s relationship — because if it did, who would we have left to ship?